When Romeo and Juliet meet at a ball they fall passionately in love. But their families are sworn enemies, divided by a bitter feud. Can their love survive against a backdrop of hatred and hostility? Kenneth MacMillan’s powerfully emotional Romeo and Juliet, an adaptation of Shakespeare’s great love story, is a 20th-century classic. The ballet exploded onto the stage of the Royal Opera House in 1965 and received one of the most rapturous receptions of any work in ballet history. It has been at the heart of The Royal Ballet's repertory ever since, amassing over four hundred performances at the Royal Opera House. MacMillan created the title roles on Lynn Seymour and Christopher Gable, who were both integral to his conception of the work. However, to MacMillan’s distress, Margot Fonteyn and Rudolf Nureyev were chosen as first cast for the premieres in London and New York, on the basis that their popularity would guarantee ticket sales. Seymour and Gable were obliged to teach the roles to Fonteyn and Nureyev, and made their debuts (as the fourth cast) at the ballet's fifth performance. When Sergei Prokofiev wrote the score for Romeo and Juliet, he faced a desperate struggle to keep it intact against Soviet censorship. Commissioned by the Kirov Ballet, the work in its original form was completed in 1935 but was denounced as ‘undanceable’ through fear of it being criticized as ‘modernist’, and wasn’t performed until 1938. A revised version was created for a 1940 production, which eventually formed the basis of three popular orchestral suites. With its dramatic and famed centrepiece ‘The Dance of the Knights’, the work is today considered to be one of the greatest of all Russian ballet scores. MacMillan’s choreography draws out the emotional and psychological intensity at the heart of the story. Set against the backdrop of Nicholas Georgiadis’s monumental designs, highlights include fierce marketplace swordfights and the three passionate pas de deux around which the rest of the ballet is constructed: the lovers' first meeting, the famous balcony scene and the devastating final tragedy. 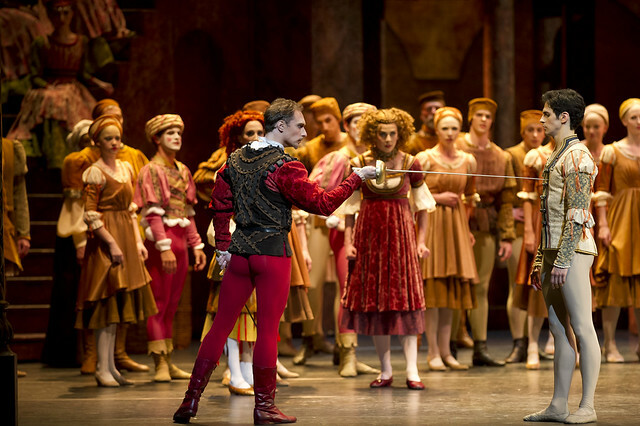 The Royal Ballet’s production of Romeo and Juliet runs from 19 September–2 December 2015. Tickets are still available. The production is staged with generous philanthropic support from Peter Lloyd, Lindsay and Sarah Tomlinson and the Jean Sainsbury Royal Opera House Fund. Why is this ballet not part of the cinema screenings? It is wonderful and is a classic, seminal ballet? Please please can it be added to the list for the next opportunity? Oh, yes! I would love to watch it on cinema screen too! That would be a splendid idea ♥ please please please! I would like to ask you if this performance of Romeo and Juliet is the same which will be presented in Royal Albert Hall on June 2014 (with the choreography by Sir Kenneth MacMillan)? Thank you for your answer. Thanks for your query. That's English National Ballet's arena production with choreography by Derek Deane.